6 eyeholes on the screen, with 8 pieces peel-and-stick hooks, to make it easy to set up. No crease - The screen is make of polyester material which is flexible, and easy to become smooth when straighten, to bring out excellent viewing image. Portable - Foldable, light weight and small size, ideal for outdoor activities. Simple Rear projection - The thin and medium clear material makes it easy to create mystifying "hologram-illusion" effect, ideal for holiday docoration. Can be applied to home theater movies, classroom training, conference room presentation, public display, hiking, outdoor activites etc. Do not suggest to wash. Please wape the dirt by wet cloth. ✅[Lightweight Design] It can be folded as small as you can, and won't take space, convenient to take with you where you go. 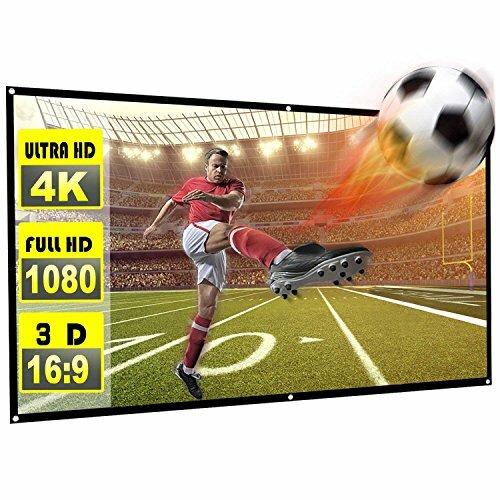 ✅[SIZE]: Diagonal Size: 100 inch, Ratio: 16: 9, Visible Region: 225 × 122 cm, Gain: 1.5, Weight: 0.75LB.The four-side black borders can enhance the picture contrast. Moreover, it is universally compatible with majority of LED, LCD or DLP projectors on the market. ✅[EASY TO USER]：The projection screen can be fixed with hooks, ropes, brackets, nails, double-sided tape. [With double-sided adhesives and sticking hooks, it is easy to install on the wall or take down from the wall. ✅[Visual effect]: support Double Sided Projection,the thin and clear material makes it easy to produce mysterious holographic phantom effects.It is suitable for multiple occasions, a great choice for home theater movies, classroom training, conference room presentations, public display, etc. ✅【WHAT YOU GET】1 x Projector Screen，8 x hooks, our 12 months worry-free product guarantee and friendly customer service. If you have any questions about this product by rhungift, contact us by completing and submitting the form below. If you are looking for a specif part number, please include it with your message.